You hate that this is happening to the seemingly decent kids playing for the Philadelphia 76ers, who lost their 22nd consecutive game Wednesday, this time 102-94 to the Bulls. This 76ers team, which did compete hard, is the basketball version of a train wreck in the making. You can’t bear to look as the crash is coming and you weep for those involved. No one deserves to go through what the 76ers’ players and coaching staff are, a management-inspired effort to give up the season for better draft position. The Bulls led 28-26 after one quarter thanks to 11 of Mike Dunleavy’s 15 points. No matter how much you can’t wait to get to next season, the NBA still makes you play 82 games. And most everyone understands you owe something to competition, except perhaps the 76ers, whose rotation is comprised of probably all but two or three players who should be in the minor leagues and likely have no role in the team’s future. So as much as Bulls coach Tom Thibodeau warned his team, it is human nature. It’s still difficult to be at your best. You are supposed to because it’s your job and your passion. But you could see with the Bulls frequently being outhustled to loose balls that even if the mind was demanding, the electrical signals to the body weren’t making it through the nerve system all the time. It was even if it’s not supposed to be when a team is set up to lose. Not that the players or coaching staff quit or weren’t competing. Thaddeus Young had 24 points and Tony Wroten and Michael Carter-Williams combined for 33 points, 15 rebounds and 14 assists with seven each, though on 13 of 32 shooting. But 76ers management apparently shooting for the greatest lottery odds traded off most of their top rotation players for second round picks and other minor future compensation during the season. It’s left the 76ers roster barely more talented than any roster in the D-League and the players facing a basketball scarlet letter as maybe the biggest losers ever as they churn toward the all-time NBA losing streak of 26 games. It truly was a winnable game for the 76ers, who had tied the game at 85 with 7:43 left before Jimmy Butler with 16 points and Augustin made the big threes that enabled the Bulls to have just enough to raise their record to 38-30 with the showdown game in Indiana Friday. The Bulls were holding on leading 98-94 after little used center Byron Mullens, who made two three-pointers earlier, added a driving slam dunk with a minute left. Augustin missed a 15-footer. 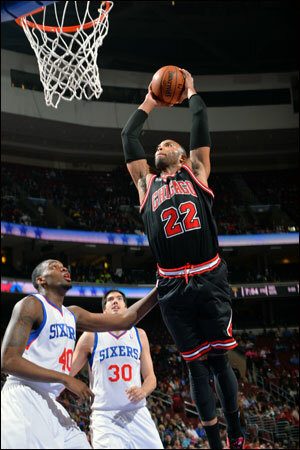 Taj Gibson, who had 19 points and 13 rebounds and 10 of his points in the fourth quarter like Augustin, rebounded. But Gibson airballed the shot. That put the run and shoot 76ers in the open floor again (28 fast break points) with Wroten going hard to the rim. The ball hung up there and then was tapped out by Joakim Noah, who had 14 points, 10 rebounds, six assists and four blocks, but also five turnovers in trying to force in too many fancy passes. The 76ers coaches and players were up screaming goal tending, which would have made it a two-point game with 30 seconds left since the ball was still on the rim. There was no call, but the officials got it right. And not just for the Bulls sake. It’s not goal tending if a ball is on the rim but rolling off, as that ball appeared to be doing. It’s probably why so many in the NBA office are lobbying for a movement to the international rules for players being allowed to touch all balls once they are shot and on the rim. It’s almost an impossible call for an official. But that’s for another day. It truly was a winnable game for the 76ers, who had tied the game at 85 with 7:43 left before Jimmy Butler with 16 points and D.J. Augustin made the big threes that enabled the Bulls to have just enough to raise their record to 38-30. The Bulls retrieved Noah’s tap out and the 76ers had to foul. The Bulls made free throws the rest of the way to make the final easier than it was. For the Bulls, it’s a road win and a win in the final analysis that equals all the others. The Bulls did that, though it never was clear until the last seconds that they would. Though players always deny playing down to opponents or not taking losing teams seriously, the Bulls offered plenty of signs early as they had turnovers on three of their first four possessions as Noah and Butler repeatedly tried to throw passes where there was maybe a few inches to spare. They would have five turnovers each, which enabled the 76ers, with barely a half court game, to get into the open for those 28 fast break points, the most the Bulls have given up in a game all season. So, yes, you have to question their insistence they expected this. But even the 76ers couldn’t have expected what they got as two of their poorest three point shooters, Young at 31.2 percent and Wroten at 21.2 percent, each made four three pointers and eight of 13 combined. That won’t happen often for them in an empty gym. It thus quickly became one of those games you can get a little tight. Because, after all, you can’t lose to those guys. Those kinds of losses feel like more than one. 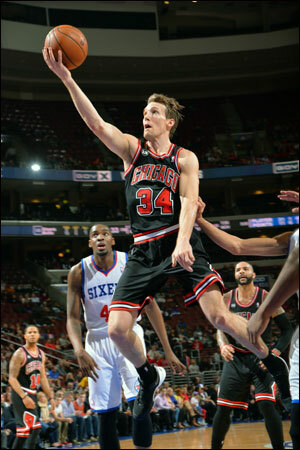 The Bulls led 28-26 after one quarter thanks to 11 of Mike Dunleavy’s 15 points. And then the Bulls seemed to be taking control with a 41-30 lead early in the second quarter behind Gibson and Noah punishing the smaller 76ers. But the 76ers came back within 52-45 at halftime with some aggressive half court traps. The 76ers — as more teams are doing — got into the lanes to anticipate the Bulls passing and turned several into fast breaks. Noah had his own runway midway through the third, taking a turnover almost full court, spinning at midcourt away from a defender and then driving in and switching to his left hand to finish, again an amazing play by a big man. But the 76ers obviously weren’t impressed and would not go away. 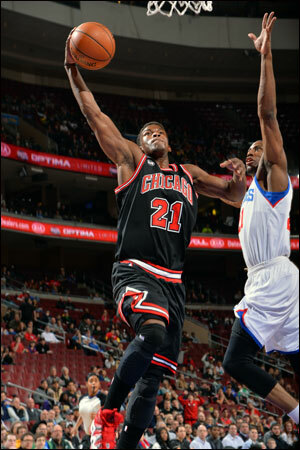 Young and Carter-Williams made threes and the Bulls led 75-69 starting the fourth quarter. It then became anyone’s game as the Bulls in multiple possessions seemed to freeze as the rebounds hit the floor and a 76er player grabbed the ball. The most egregious was early in the fourth when three Bulls watched a rebound fall between them as all began to run down court. Instead, someone named Elliott Williams grabbed the ball and dunked. A pair of threes then by Mullens made it 81-80 Bulls with 9:11 left and, as Holmes would say, the game was afoot. Taj Gibson, who had 19 points and 13 rebounds, scored 10 of his points in the fourth quarter. Rarely, for obvious reasons, is there much enthusiasm at a 76ers game. But the crowd was roaring after that Young three tied it at 85. After the teams exchanged misses, Butler coolly made that game changing three from on top and after a wild Carter-Williams miss, Augustin added his three. The Bulls would have enough cushion to get out of town without any more embarrassment. After all, they had lost in Philadelphia the first week of the season. That was when the 76ers plans were going awry, though we didn’t know. They started 3-0 and were a respectable 12-21 in early January. It apparently was too good. I look at the 76ers as I do the baseball Black Sox. There were some guys trying, but others sabotaged the rest. That’s what’s happened with these 76ers as you see the staff work hard and the players try and care. There have been bad teams before in the NBA, many worse than this one in Philadelphia that is now 15-53. The Bulls had several in the early 2000s worse. But no one’s done what’s happened with the 76ers as apparently winning too many games they basically gave away half their team in midseason. It’s offensive for basketball and the idea of competition. Though no one in NBA headquarters cares to condemn an owner — whom they technically work for — the league again is studying what to do about the lottery because of the 76ers. But it’s unfortunate for these players, who deserve so much better for the effort they’ve showed, like against the Bulls Wednesday. The Bulls will see them at the United Center Saturday, and at least they know they could be embarrassed if they don’t take them seriously.